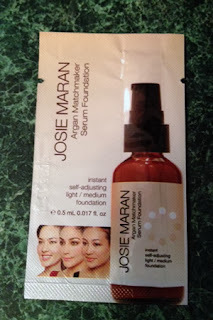 THE SKINNY: After only one use, I am totally enamored by Josie Maran Argan Matchmaker Serum Foundation. I'd seen ads in magazines for the liquid foundation but never really thought twice about buying it. The serum uses argan oil -- which is pretty amazing stuff -- and I was worried that my combination skin might get a little too shiny. This stuff went on smooth and matched by skin color perfectly (light/medium). The foundation did go one a light light (almost making me panic) but then "adjusted" nicely. The finish was flawless ALL DAY LONG. Never a speck of shine or hint of dryness. In addition to looking great this serum foundation also claims to help fight signs of aging. I can't vouch for that after only using a sample. It is also made without parabens, sulfates and synthetic fragrances. There are only two (small) hangups: This is an expensive product and it is exclusive to Sephora. CHECK IT OUT: Josie Maran Argan Matchmaker Serum Foundation is available in three shades that adjust to your natural skin tone. Find it at Sephora.